Update: DigiTimes has just reported that the 9.7-inch iPad 5 will be 25-33 percent lighter than its previous generation, and it will come with the same 2,048 x 1,536 Retina display. iPhone 5 owners across the world have complained about the battery life, and some say they would rather a thicker iPhone with all day battery life rather than a thinner iPhone with less battery life. Is this going to be the same story with the iPad 5? The current iPad 4 is a great tablet for both personal home use and business use in the office etc, but then you have the general user where they lay down on the sofa, in bed or on the beach and complain the iPad 4 is too heavy and aches their arms after long periods. iPad 5 comfort vs battery life is something we wanted to talk about because of what consumers have been saying, we believe the iPad 5 will have the same design as the iPad mini and Apple will never step back, they will move forward and make the iPad 5 thinner than the iPad 4. MacRumors back in April reported that the iPad 5 is estimated to being 25% lighter and 15% thinner than the current iPad. If this were the case then the iPad 5 size would be somewhere around 7.5-8.0mm thick, which is a lot different to the 9.4 mm thickness of the iPad 4, the iPad mini is only 7.2 mm. So this would mean a 2mm reduction, now some might think the battery life will get worse because it has a thinner bezel, the iPad mini has a built-in 16.3-watt-hour rechargeable lithium-polymer battery and provides up to 10 hours of general use. The iPad 4 has a built-in 42.5-watt-hour rechargeable lithium-polymer battery and still provides up to 10 hours of general use. So it does not matter how thin Apple makes the iPad 5 it will have around 10-hours battery life with general use, it could be possible to stretch it to 12 hours but we cannot see it going beyond that this year. The iPad 5 could possibly come with GF2 touch technology like the iPad mini, it has been said the iPad 5 could come with a 25-30% smaller battery at 8,500-9,000mAh. For those that believe making the iPad 5 thinner will jeopardise the battery life needs to think again, the iPad 5 will adopt the iPad mini design that is certain. For those that believe comfort comes before battery life and that a thicker bezel allows for a larger battery have been misinformed, the iPad 5 will be thinner, lighter and will still have the same battery life as the iPad 4 and iPad mini. 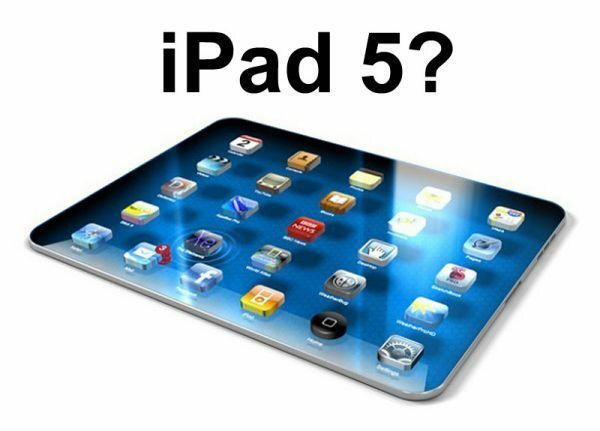 Please let us know what iPad 5 features you would like to see? Dual screen, so real multitasking. Water and dust proof. Quad core.